After a busy holiday season, most people will say that one of their New Years Resolutions is to lose weight. 1.) Write it down: Is it daunting to write down everything you eat? Yes. However, statistics have shown that if you write down what you put in your body, you’re more likely to feel more control over what you’re eating. Nowadays, there are more and more free websites that provide a food log to help you keep better track of your diet. Did you resolve to exercise more? Then make a calendar just for tracking your exercise- be sure to note the day time and duration. 2.) Think Big, Start Small: So you would like to lose 10 lbs. this year. Great. But if you look at it as 10 lbs total all of the time, it might be intimidating. Breaking down a larger goal may be a great key to your success. Instead of saying, I want to lose 10 lbs. this winter, re-train yourself to say, every 2 weeks Id like to lose 1-2 lbs. Keeping some short-term goals may have you dropping those unwanted pounds in no time. This is easy to do for other resolutions as well. Want to become more organized this year? Perfect- start one room (or portion of a room) at a time. 3.) Victory Dance: It is so important to celebrate your weight loss or healthy eating goals once you’ve reached them. The key is not to celebrate with a cookie. When you’ve reached a goal (even a smaller one like I mention above), reward yourself. Get a massage, have a date night, get that new hot pair of shoes! By rewarding yourself in this way, you’ll stick to your goals! 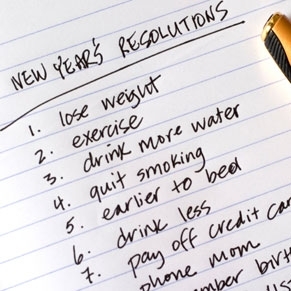 Heres the fun thing to think about- the more resolutions you stick to- the more goals to celebrate! Author Smart WorkoutPosted on January 20, 2011 June 12, 2017 Categories Health Help, NutritionTags exercise, keeping fit, keeping weight off, new year's resolutions, nutrition, weight lossLeave a comment on Keep your Resolutions!